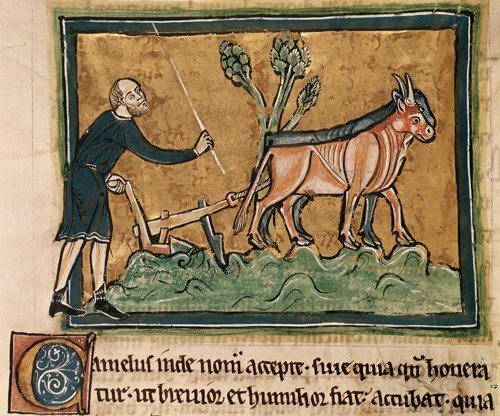 The Heavy Plough and the European Agricultural Revolution of the Middle Ages. Abstract: This paper offers a rigorous quantitative evaluation of Lynn White’s hypothesis that the introduction and diffusion of the heavy plough was a source of population growth and urbanization in Europe in the Middle Ages. The work of White and other historians suggest that the heavy plough would be more suitable on heavy, clay soils and that its widespread adoption happened from 1000 AD onwards. Consistent with this, we find that regions with high shares of heavy plough suitable land had significantly higher population density and more cities (relative to area) after 1000 AD. Introduction: In the period from the 9th century to the end of the 13th century, the medieval European economy underwent unprecedented productivity growth. This particular period has been referred to as the most significant agricultural expansion since the Neolithic revolution. In his pathbreaking book Medieval Technology and Social Change ” target=”_blank”>Medieval Technology and Social Change, the historian Lynn White, Jr. argues that the most important element in the “agricultural revolution” was the invention and widespread adoption of the heavy plough. Building on earlier work by Pirenne, White also offers an account of the gravitational shift from South to North Europe in terms of comparative development in which the heavy plough played the key role. The earliest plough, commonly known as the ard or scratch-plough, was suitable for the soils and climate of the Mediterranean; it was not suited to the heavy soils found in most of Northern Europe. In these latter areas, soils “offer much more resistance to plough than does light, dry earth”. As a consequence, Northern European settlement before the Middle Ages was limited to lighter soils where the ard could be applied. The heavy plough may have been crucial in changing this.